New report by UN Special Rapporteur constitutes milestone, human rights organisations say. 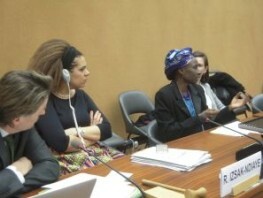 GENEVA, 17 MARCH 2016 — Caste-affected countries should take urgent and comprehensive action to combat caste discrimination, the UN Special Rapporteur on minority issues, Rita Izsàk-Ndiaye, says in a new report on the issue published this week. The report was presented and discussed in the Human Rights Council on 15th March. “The issue of caste discrimination has touched me since the beginning of my mandate. It is unacceptable that 260 million people are considered inferior. This cannot be tolerated,” the Special Rapporteur said yesterday as she commented on the report at a side event on ‘Minorities and caste-based discrimination’ at the UN Human Rights Council (HRC) in Geneva. The event brought together experts on caste-affected countries in Asia, the Middle East, Africa and Europe, highlighting the global nature of this serious human rights issue. Together with Dalit representatives from across South Asia, they explored ways of eliminating caste and descent-based discrimination, which affects an estimated 260 million people around the world. Two speakers made particularly powerful interventions about the situations in Yemen and Mauritania where caste discrimination remains deeply ingrained in people’s mindsets and at times takes on extremely violent forms, but is mostly ignored by the countries’ governments as well as the outside world. “Caste discrimination is a poison within Mauritanian society. We need a campaign against it and very strong legislation that prohibits discrimination against lower castes,” said Salimata Lam, coordinator of SOS-Esclaves, an organisation working against caste-based slavery in Mauritania. The event was a follow-up to the Special Rapporteur’s presentation of her report on caste and analogous forms of discrimination to the HRC on Tuesday. In the report, she calls on caste-affected states to adopt legislation, implement existing laws, raise awareness of the issue, develop national action plans to combat caste discrimination and take “robust action” on caste-related violence against women and girls. “This report is a very courageous effort. It raises the hopes of millions of Dalits who are subjected to inhuman forms of discrimination based on caste, work and descent. We dream that this could be a step on the way to a UN Convention on the elimination of caste-based discrimination,” said Manjula Pradeep, Executive Director of the Indian Dalit rights organization Navsarjan. Other Dalit rights campaigners from across South Asia have also welcomed the report. 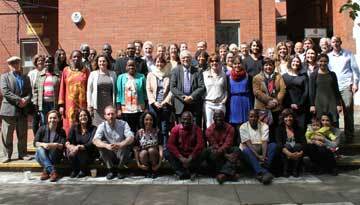 They agree that it will be an important tool in their struggle against caste discrimination in their home countries. “The report will not remain as just a document. We will use it for advocacy work, and it will carry a lot of weight in our discussions with national human rights institutions,” said Henri Tiphagne, a leading Indian human rights advocate and IDSN board member. Minority Rights Group, Human Rights Watch and IDSN have commended Ms. Izsàk-Ndiaye for addressing the important and long-neglected issue of caste-based discrimination. “We believe that this report will constitute an important milestone in the progressive recognition by the UN and the community of states of the significant harm caused by caste-based human rights violations,” the three organisations said in a statement delivered at the HRC debate. During the debate, several states voiced strong support for the Special Rapporteur’s choice of a challenging subject for her latest report. Many noted the particular vulnerability of caste-affected women, others expressed shock about the scale of the problem – Nigeria described the number of people subjected to caste discrimination as ‘mind-boggling’.